Synthetic peptide corresponding to Human IL-29 (N terminal) conjugated to keyhole limpet haemocyanin. 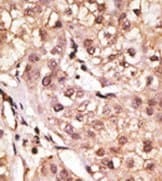 Human hepatocarcinoma tissue, Jurkat cell lysate. ab38569 was purified through a protein G column and eluted out with both high and low pH buffers. It was neutralised immediately after elution, followed by dialysis against PBS. Our Abpromise guarantee covers the use of ab38569 in the following tested applications. Cytokine with immunomodulatory activity. May play a role in antiviral immunity. Up-regulates MHC class I antigen expression. Ligand for the heterodimeric class II cytokine receptor composed of IL10RB and IL28RA. The ligand/receptor complex seems to signal through the Jak-STAT pathway. Belongs to the IL-28/IL-29 family. Formalin fixed and paraffin embedded human hepatocarcinoma tissue stained with ab38569, followed by AEC staining. Publishing research using ab38569? Please let us know so that we can cite the reference in this datasheet. Can you please indicate the percent identity of the immunogen used to generate ab38569 to the swine protein (ACJ70707.1). I am looking for an IL-29 anitbody that will react very well (nearly equal to human) with the swine protein. Based on this level of homology, I do not think that there is a chance that the antibody would work in swine samples, as generally we look for about 85% level of homology before recommending an antibody. In general there is only about 70% level of homology between Swine and Human, and so I do not think that either of the other 2 IL-29 antibodies would work in Swine samples. If there is anything else that I can help you with, please let me know.